a healthy and fulfilled life... every day. Whew... this week was BUSY! It's been almost a week since my last post... I'd like to post more often than that but my schedule was jam packed this week. It's nice to sit here and relax for a little bit this morning. Onto the subject at hand... Old Injuries. For those who know me or follow me on twitter @sherriZZA... you know that four months ago I tore my hamstring then threw out my back (specifically my right trapezeus, where it attaches to the spine), 2 weeks ago. I've kept up a modified exercise routine throughout and I've been sure to stretch and take care of these muscles that I injured. 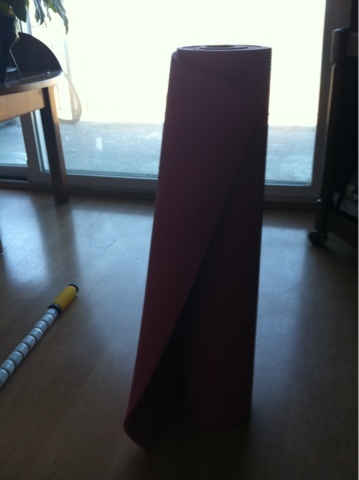 What I failed to do after I tore my hamstring... was to stretch and be mindful of my old injuries. Here are a few of my old injuries: I first injured my trapezeus about a year and a half ago... I have some knee issues and since I'm a runner... I have IT band syndrome that I have to stay on top of on a consistent basis. I also used to teach kickboxing so sometimes my hip flexors get weak. I'm not listing off these things for you to know, I'm listing them because I suggest that you make a list in your head right now of injuries you've had in the past... since high school. Write them down. Ok now, do you stretch these old injuries on an ongoing basis? A few times a week? Here's the deal... these injuries may be healed but they are more apt to re-occur over time, even if you work out all the time and especially if you decide to dive head first into an exercise routine. I have been so concerned about my hamstring, that I forgot about my back and haven't been stretching it as much. I have also been using heavier weights to lift back, which I need to be careful of doing. Now, I haven't been able to lift upper body for almost 2 weeks because my trap is still healing. (acupuncture is my secret weapon though - I'll talk about this in another post). The good news is that I've taken excellent care of my hamstring and with a combination of stretching every day, some strength exercises, and using my "stick" and "foam roller" I'm finally running again (HAPPY SHERRI). But, now my hip flexors are sensitive again because I've jumped right into running without stretching them. So, now I need to slow down and make sure I'm getting a full stretch in, almost every day and especially these re-occuring issues, every time I work out. A great way to take care of all of this is to add Pilates or yoga to your exercise routine at least once a week. I taught Pilates for years and can't remember ever having an injury during that time - makes sense right? There are also two tools that I LOVE especially for my IT bands (learn more about IT band syndrome here (it is very common in women, Type A's, and high mileage runners (go figure! ): http://bit.ly/yghGn4) and my hamstring. 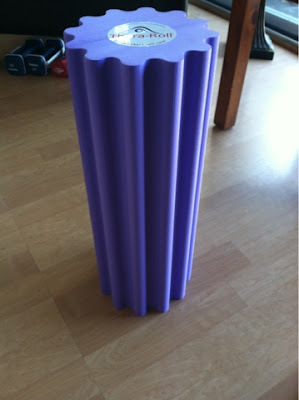 "The stick" and a "Foam Roller" (photos below). These items compress and stretch muscles by massaging deep into the tissue. It breaks up the lactic acid build up and penetrates deep into the muscle to release tense muscle fibers. I understand that time is of the essence for almost everyone. I personally do not stretch enough because frankly, I'm so busy that I try to get in the best workout possible before I head into work for a 10-11 hour day. That's an excuse though, isn' t it? My hamstring was injured and I wanted to be able to run again as soon as possible so I found time to stretch. I will be adding Pilates back into my routine and also make sure to get in a stretch every day. (even if you don't work out - give yourself a 5-10 minute stretch in the morning before you start your day - trust me you'll feel better). Factoid of the day: Each muscle you stretch should be held for 40-60 seconds to be effective. When I first got certified in 2004, it was 20-30 seconds. When I got re-certified in 2010, they re-wrote this rule. Interesting, huh? 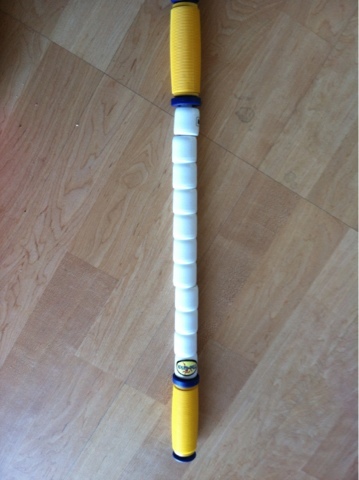 "The Stick" for Runners - Great for IT Bands & Hamstrings... Press firmly for about 20 times. Therma Roll, "Foam Roller" Great for hamstrings, glutes, quads, calfs, etc. Onto the recipe of the day... I've posted this meal on my Instagram (http://instagr.am/p/Hc44CdhAK1/ ) account (@sherriZZA) twice and received a lot of interest in the recipe. It's SO delicious and super healthy. I found the recipe on Pinterest.com and have made it 3 times. It is super healthy but it's also a bit high in calories so I modify the recipe by using more lemon juice and of course, Barilla Protein Plus Pasta! I also add shredded chicken and serve it with a side salad. Enjoy and have a relaxing Sunday! 1. Bring several cups of water to a boil in a medium sized pot. 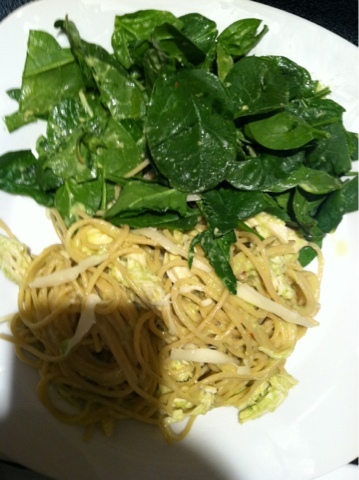 Add in your pasta, reduce heat to medium, and cook until Al Dente, about 8-10 minutes. 2. Meanwhile, make the sauce by placing the garlic cloves, lemon juice, and olive oil into a food processor. Process until smooth. Now add in the pitted avocado, basil, and salt. Process until smooth and creamy. 3. When pasta is done cooking, drain and rinse in a strainer and place pasta into a large bowl. Pour on sauce and toss until fully combined. Garnish with lemon zest and black pepper. Serve immediately. Makes 2 servings. Please note: This dish does not reheat well due to the avocado in the sauce. Please serve immediately. If I bruise from my stick does that mean take a day off? or have at it because it's working? No take a day off and go lighter the next time you do it. You are likely pushing down too hard. Superbowl Sunday - Here we go Pats!! Sherri D'Alessandro. Simple theme. Theme images by MichaelJay. Powered by Blogger.